In any case, my spiralizer can do more than create a much happier looking vegetable. It can distract a moody teen. Alex’s swim meet did not go well at all for him, so in order to lighten things up a bit, I put him to work on the spiralizer. Instant smiles! This illustration, I believe, proves that distraction techniques work on toddlers AND teens. Parents of tantrum-throwing toddlers, pets, and teens NEED a spiralizer. Within minutes, there’s a bowl full of festive-looking vegetables and enough wide-eyed wonder to keep the hope of unicorns alive for years to come. “Great. Now what will you do with all the zucchini noodles?” Nate asked when we were done. ½ cup of mini sweet peppers in various colors—sliced. 1) Push the chunks of zucchini through the spiralizer. 2) Boil the zucchini “noodles” in salted water for 2-3 minutes and set aside. 3) Make the dressing by whisking together the lime juice, soy sauce, fish sauce, brown sugar, and half the diced Serrano pepper in a bowl. Set aside. 4) Lightly salt and pepper the chicken. 5) Heat up the oil in a skillet and add the garlic and the rest of the Serrano pepper. Cook the mini sweet peppers. Then, add the chicken and cook it through. 6) Heat up the eggs in a separate skillet with nonstick spray or a little bit of cooking oil. Break the eggs into small-medium-sized pieces after they cook. (I used the microwave instructions for the egg substitute and then broke the eggs into small-medium-sized pieces). 7) In a large bowl, combine the cooked zucchini noodles, the chicken and pepper mixture, eggs, and dressing. Mix well. 8) Top with chopped peanuts, cilantro leaves, and onion slices. Nate and Alex agreed that I should make this recipe a “keeper.” They devoured it in seconds and there were very few leftovers. The spiralizer then, in my opinion, is one gadget I could never tire of using. I would dare to say it creates relaxing “work” that brings me happiness. It’s what I’ve always imagined knitting or crocheting would be like, if I ever had the patience. I’d just sit in front of the television for hours and crank out cute little bowls of zoodles. Yes, that’s just what I’ll do with less-than-exciting foods and bad days from now on: Send them both through the spiralizer. Your Turn: Do you have a favorite kitchen gadget that you enjoy using? If so, what is it and why do you enjoy it? Or, have you ever used distraction techniques on toddlers/teens/bosses,/customers/students/co-workers? If so, what did you do and how did it work out? I sometimes pull a “red herring” on students by surprising them with a request to read a poem aloud or the material or to perform a small skit. I distract them by presenting a lesson and then suddenly draw the attention to them. For my dementia patients, you always have to distract them or they will stay in a foul mood all day! Wow–I had no idea that distractions work for dementia patients–thanks for sharing this idea here! And, cutting boards can never be ignored–good catch! My son loves Pad Thai…this is on my to-do list!! I agree – a spiralizer is fun to play with. I just made a giant pot of minestrone which only I could eat as everyone else had the stomach flu. Now I am very tired of minestrone! No more zukes for me for awhile. Minestrone soup sounds so good! Yum! Yup, distraction works for my toddler. Well, sometimes. Sometimes, she’s on to me! Love zoodles but never had this before. I’ll have to try it sometime. I read this, loved it, “liked” it, and then drove home from work. However your questions, especially “…have you ever used distraction techniques on toddlers….” kept returning into my mind, with now favorite memories of my two “young men” sons when they were toddlers. So, I am responding; I traveled for a time in my late twenties, and this involved a lot of air travel. My heart would go out to young mothers with little children, as people would only offer looks of annoyance as the child would become restless and cranky. Later with my own, and still traveling, I would arm myself with “the bag of sanity”. This was filled with never-before-seen small items, single sheets of coloring books, flat crayons that would not slide off of the little table, little toys, new books to read, and many, many snacks! So absorbed were they, that after a 2 1/2 to 3 hour flight, that as we departed I would receive compliments on how “well behaved they were”………exhausted by this time, I would think…….you have no idea. But say thank you. 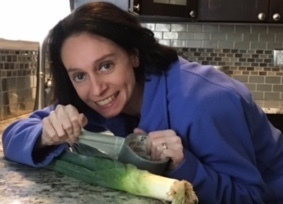 Thank you for the happy memorys, Fixin’ Leaks and Leeks! Certainly used distraction techniques! Must try a spiraliser too. One way to get through a glut of courgettes in the summer. Wonder if they can be frozen? Good question! I found the answer on this blog page: http://inspiralized.com/ground-rules-spiralizing-and-storing-noodles/ It seems that they don’t defrost very well. Some vegetables, once spiralized, can maybe be refrigerated, according to the link above, but the texture might not be the same. Thanks, had a hunch but that confirms it! Courgette chutney it is! That looks yummy! I think my favorite thing to use in my kitchen is my crockpot. I love that I could just dump a bunch of foods in there and go to work and then I come home and dinner is ready. It makes me feel like someone has been cooking for me all day. What an interesting and delicious looking recipe with zoodles! I’m sooo.. tempted to buy a spiralizer. The distraction element makes it even more attractive!